You have decided to take the boating trip of your dreams. Your crew, your location, and your provisions have been selected. All that is left is to rent a boat. 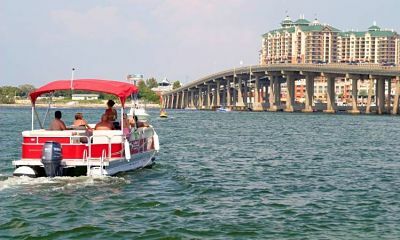 If you are an experienced boater, perhaps you already have the exact model and size of watercraft in mind. However, if you have not spent much time on the water, you may be unsure about the best type and size of boat to take on your trip. If you are lucky, you may have the counsel of people who have boated in the area where you are headed, and have similar comfort levels. If you are not so lucky, choosing from the large number of styles and sizes of boats may seem confusing. Though you may have an idea of whether you would prefer to sail or use a powerboat, there are many different styles, sizes, and layouts of these boats that make them good for some locations, but not others. Are you considering a standard sailboat or a catamaran? Does your trip work better with a tug-style powerboat or a cabin cruiser with dual outboards? Answering this question really boils down to two factors: where will you boat and how many people are coming with you. Water Conditions: The body of water you are using is an important factor in choosing the right boat. If you are headed for a day of waterskiing on the lake, you do not need a long boat, and do not need to consider including enough room for your entire family reunion. A few people can ride at a time, and then you will return them safely to the dock after a few laps, then pick up the next group of people. However, for a day of deep-sea fishing in more serious chop, you will likely feel tossed around if you choose a boat that is too small and light. And instead of fishing, you may be the one who is tossing something. If you are headed to an area that has five- or six-foot standard swells or waves, you will feel less beaten-up in a boat that is at least 25 feet long. If you are uncertain of the size of boat that works best on the waters where you are traveling, ask around to see what the most common sizes and styles used in the area are. There will certainly be those that push the limit in both directions and swear by it, but if you go with the average, you will likely find the best fit for the location. Distance Traveled: The length of time you will be boating is another thing to consider when choosing a vessel. If you are headed on a longer journey, you need to have the indoor accommodations to make that trip comfortable. This means beds, toilet facilities, and a workable galley. Sailors must also be certain that they have a boat that is well-prepared with the external components for a long-distance journey. For power boaters, fuel is the other big consideration. It is important to choose a boat that is built for long-distance cruising because it has the tank capacity to go long stretches without needing a fill-up. Choosing a boat that can go longer than the longest stretch between filling stations allows for lost fuel due to weather, winds, storms, leaks, or other unfortunate possibilities. Overnight Accommodations: Ensuring that you can live comfortably on your boat for the duration of your trip is another important consideration. The makeup of your party will decide whether everyone must have a bed, or if a few sleeping bags on deck for the kids will suffice. The head facilities, or toilet, must also match the size and needs of your group. You can get away with something smaller if you plan on heading in and pumping out, or will be using a macerator at sea to dump the holding tank, but may need a larger facility for locations where dumping is illegal, or where you will not be headed to a marina until the trip is over. Cooking capacity is another important thing to factor into your trip. Is there enough space to store and cook the food you need? Moorage is another consideration. Is your boat able to fit at the marinas where you plan to stay? Be certain to check not only the length of accommodations, but the beam. Too wide is just as much of a problem as too long. If you are sleeping on a mooring buoy or anchoring, be certain that the depth of the water will not have you suddenly running aground with the tide. Field Trips: The activities you are planning will also help define the boat type you need. If you are diving or snorkeling, you will need some room on deck to store gear, and an easy access route on and off the boat. If you want to tour some shallower locations, a boat with a low draft that will not run aground is a good idea. People who head to shore need to consider either having a landing-craft style boat that is designed to run up to the beach, or a good anchor and a dinghy. Fishermen should have enough room on deck for themselves, their gear, a storage space for their catch, and room to give their party a wide berth when hooks or other gear is flying. Will you be headed under bridges or arches? Be certain mast and fly bridge height can be accommodated for in your travels. The number and makeup of your party is another important factor to consider before you choose your boat. All boats have a manufacturer rating for the maximum number of people that is recommended on the vessel. This is a safety concern, and though it marks the top of what is safe, it may not be comfortable for a long trip. Staying far enough beneath this number to be comfortable is a good idea, and will likely make the journey more pleasant for all of your crew. Day Trip or Overnighter: The overnight capacity of a boat is only one component when it comes to multi-day trips. The other important thing to think about is the makeup of your group. On longer trips, it is important to consider the comfort level of your group. This may be vastly different than your personal comfort level, and the more you can play to the needs of your more inexperienced or uncomfortable boaters, the more pleasant the journey will be for all of you. Do you need some privacy and space on your vessel? It is fine for you and your fishing buddies to have beds separated by merely a curtain, but if you are taking a trip with your family, more substantial accommodations may be necessary . Small quarters and mixed personalities can be a volatile combination in certain situations, and considering whether your group needs a spot to separate members from time to time can be very smart planning. Catamarans are great for larger groups who crave some privacy, as they often have four rooms located at the far corners of the vessel, and a common central living area to gather. Certain styles of powerboats can provide different areas as well, particularly those which have both a house and a fly bridge to choose from. Skill Level: Larger boats provide more room and possibilities for luxury, but this often comes at the cost of maneuverability. Your designated captains need to be comfortable docking the boat that you choose in tight, slow-speed conditions, and you must have enough crew on board to assist them in safely tying and untying lines. Budget Level: Know what you can comfortably afford, and stay within that number. For power boaters in particular, it is important to remember that the cost of rental or purchase is only the first cost, but a day of boating also carries a fuel cost as well. You may be able to split this cost with a group, but as you add more people to the trip, you will likely need a larger and more expensive boat. Whatever your plans, there are a number of boats that will work wonderfully for you. By planning well, you will likely find something that suits most of your needs, even if it is not perfect the first time. When you do decide, keep notes on the things that did and did not work for you on board, so you can watch for those features when planning future vacations.